ULEVs range from pure electric vehicles and fuel cell electric vehicles, to plug-in hybrids and extended range electric vehicles. These are also the thresholds for the government’s consumer incentive scheme, the Plug-in Car Grant (PiCG). Most ULEVs on the road today use alternative fuels such as electricity and hydrogen to drive an electric motor, with batteries commonly used as an energy storage device. In most instances these batteries are charged by being plugged into a dedicated chargepoint or directly into the mains, whereas hydrogen vehicles can be refuelled at specific refuelling stations in a similar way to refuelling a petrol or diesel vehicle. For more information on ULEVs read the SMMT ULEV guide or visit the Go Ultra Low website. Pure electric vehicles (EVs) – powered wholly by a battery which is charged from the mains. Almost all manufacturers offer pure electric cars, many of which can now travel upwards of 200 miles on a single charge. Plug-in hybrid electric vehicles (PHEVs) – Offers the best of both worlds, combining an electric motor with an internal combustion engine. Typically the battery range is in excess of 20 – 30 miles, good for short urban journeys. For longer trips, or if the battery charge is depleted, an efficient petrol or diesel engine kicks in to power the vehicle. Extended-Range electric vehicles (E-REVs) – similar to pure electric vehicles, can typically travel up to 150 miles on a single charge however contains an on-board ICE generator that can charge the battery when the level of charge drops below a certain level. Unlike a PHEV, the ICE generator does not directly provide power to the vehicle. All pure electric cars qualifying for the PiCG must be able to travel at least 70 miles on a single charge and many are capable of 100 miles or more. For more information about the PiCG incentive scheme visit the UK Government website. Fuel cell electric vehicles (FCEVs), with zero emission at the tailpipe, can become a key part of the portfolio of technologies to help deliver a cleaner environment and improved air quality. FCEVs are relatively new to the UK market, with the first models only arriving in autumn 2014. FCEVs are nonetheless an integral part of the Automotive Council’s Passenger Car Low Carbon Technology Roadmap, while hydrogen as a transport fuel features in the Council’s recently launched Energy and Fuels Roadmap. The UK H2 Mobility (UKH2M) roadmap projects annual UK fuel cell vehicle sales of more than 300,000 by 2030, by which time 1.6 million of these vehicles could be on the road and supported by 1,150 hydrogen refuelling stations (HRSs) providing full national coverage. 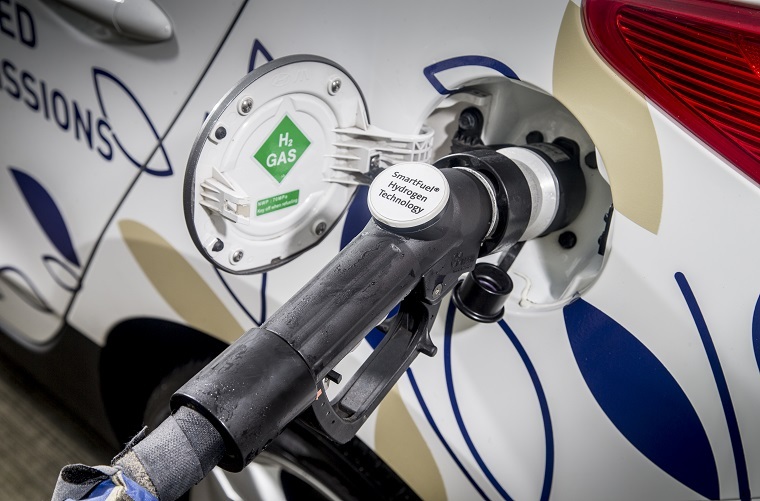 The SMMT FCEV Guide is a non-technical, easy-to-read document to keep the wider automotive and gas industries, its stakeholders and motorists informed of the latest developments in hydrogen fuel cell technology and FCEVs in the UK. This Guide explains how hydrogen fuel cell technology works, FCEVs available in the UK, the technology’s benefits and safety credentials, as well as the practical information such as refuelling.